Now here is a long-time favourite. A hungover Sunday’s solution is always in the Angel’s arms. Even if it means travelling an hour from Greenwich and cowering in the corner till that spectacular Sunday roast comes around. Sorry, I think I drooled on the keyboard. Trying to pin the Lost Angel’s design is a bit difficult. Its jazzy, Victorian, 60’s randomness, upscale pub vibe somehow *works*. 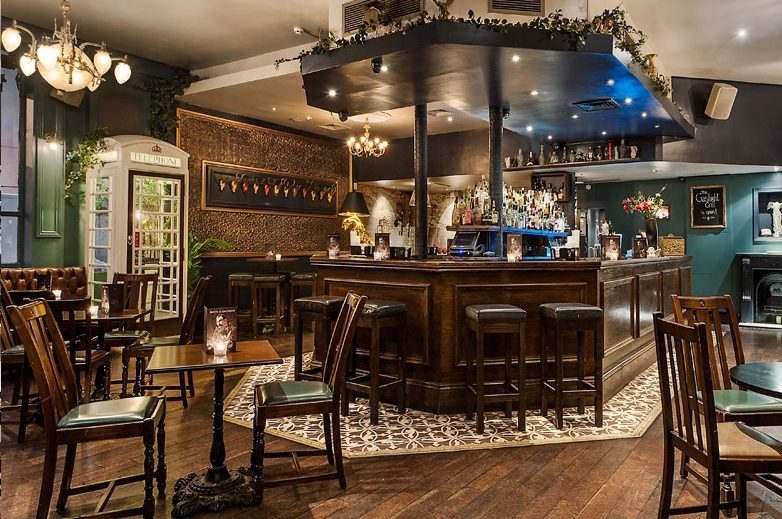 It lends to a really comfortable, relaxed atmosphere with live music in the day time; to a raucous party in the evenings – both indoors and in the large garden in the back. It’s that laid back attitude that makes it one of my favourite Sunday spots. But it’s not just that, the LA hosts several events, from various DJ nights, extended happy hours throughout the week, and Gin Soaked Thursdays – where you can explore the LA’s reputation as a gin palace with a choice of its 30 different gins at 6 pounds each. 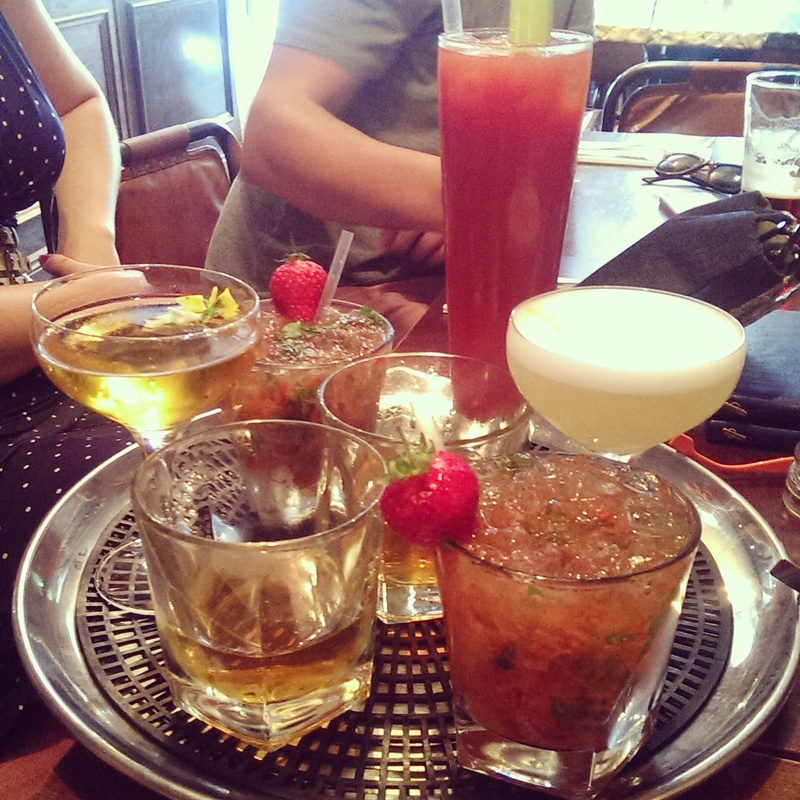 Drinks wise, the menu is varied, but tends towards the sweeter on many occasions – but there are still drier, intense cocktails to choose from. Classics can always be requested. Without argument, their Bloody Mary game is on point. And they dish them out faster than you could believe. The Bottomless Bloody Mary Sundays get you as many as you like for only 15 pounds, and to that deal you can add a Sunday roast for 10. I normally go straight for the Spice Route Gimlet, Opihr Oriental Spiced Gin’s playfulness blends wonderfully with cardamom and lime cordial, and a star anise garnish. A strong gimlet with a spicy Eastern twist, don’t let the lime cordial-instead-of-juice fool you, this drink still packs a punch. Cucumber, Jalapeno & Coriander Margarita…does exactly what it says on the tin. Lively, spry, spicy as all hell, this drink is perfect for the afternoon. Another bar could take a lesson here on how to salt a rim; you’re not supposed to make the drinker cringe. The Marrakesh Martini, saffron infused Beefeater gin, apricot liqueur, orange bitters, spiced sugar, ginger and lime juice has great potential, but often is drowned out by the apricot liqueur. A good idea is to let the bartender know to turn that down a bit. The Strawberry Amaretto Sour makes an excellent dessert drink with fresh strawberries and egg white, as well as the Lost Skipper with dark rum, Chambord, blackberry jam and red wine. The admirable aspect to the LA’s cocktail list is how straightforward they are, often twists on the classics, they do exactly what they say will – which makes the Lost Angel a great introduction to cocktails. This is where the Lost Angel’s charm lies: It’s laid-back, and out there to make a fun drink, without overcomplicating things, and without pretension. It is a reminder that complex reductions and vaporisers aren’t necessary to earn high points, neither is unwavering devotion to the classics – simplicity can be the key to a welcoming venue on a harsh Sunday morning. PS: Please update the website’s cocktail menu! People be missing the Jalapeno Margarita! This entry was posted in Bars & Cocktails, Gastronomy and tagged Bar/Restaurant, Battersea, Food, Gin, Live Music, Quirky, Sundays.